Happy Friday friends! I have several cute li'l vintage purses hiding in the depths of my closet - I'm trying to remember to pull them out and use them! This one I found as a kid in an antique store (my mom and I did lots of antique-ing when I was young) and loved the gold brocade and rhinestone clasp. I'm pretty sure my mom thought it was a bit sad - dirtied at the corners and stained. But you know, a kid doesn't see that; I just saw the shininess! She prefers the tapestry, mesh, and beaded bags and has a nice collection at home (one of my favorites is a tiny sterling silver mesh purse from the 1800s). Anyways, I've linked several cute ones on eBay if you want to check them out! And lastly, thank you soo much for stopping by today! Your visits to The Dapper Bun are what makes this blog special. I am always on the hunt for skirts at goodwill that I can hem. Haven't lucked out yet, but I keep trying! Would love to score a red one like the one you found in your other post! Your polka dot blouse is adorable! 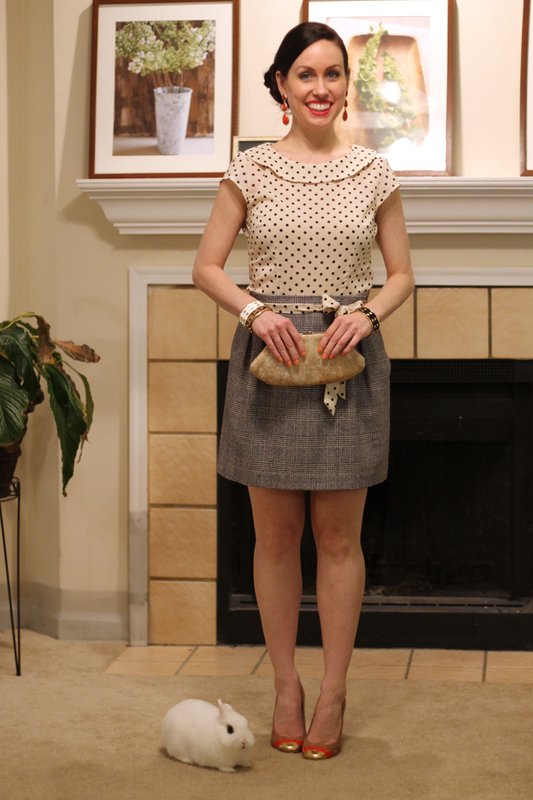 Love how you did pattern mixing with the skirt! Lately I've been buying vintage clutches on Etsy, so many on there :) Have a great weekend, Mary Ann! love that blouse - and I love the clutch! I'll have to check out eBay! I just can't get enough of your precious bunny :) Gorgeous top, lipstick color and smile! LOVING the shoes too! Have a great weekend!! awe so pretty!!!! great combo! I LOVE the pattern mixing! That blouse is very chic! Aaaaw your bunny is simply the cutest! Very classy look! What a cute idea to tie that matching ribbon/belt around your waist. It looks great, Mary Ann! First off, you rock a bold lipstick better than anyone. Second, love the Chanel nail color...I might need to seek that one out. Loving this blog and your lovely bunny. I came here for the Birdcage veil DIY and have stayed for everything else! How amazing is it that there is a little white rabbit in your photos?! Love it! I found your blog via blog therapy's blog hop! Yours was the first blog I clicked because of the catchy name! I am now following you =). Come check out my blog when you get the chance! Lovely outfit :) Love the clutch and shoes ! You have such an elegant style! I love the whole look and especially your shoes! I love that you paired your top with this belt, so cute! You look beautiful and the bunny rabbit is adorable! This look is so classic and chic! 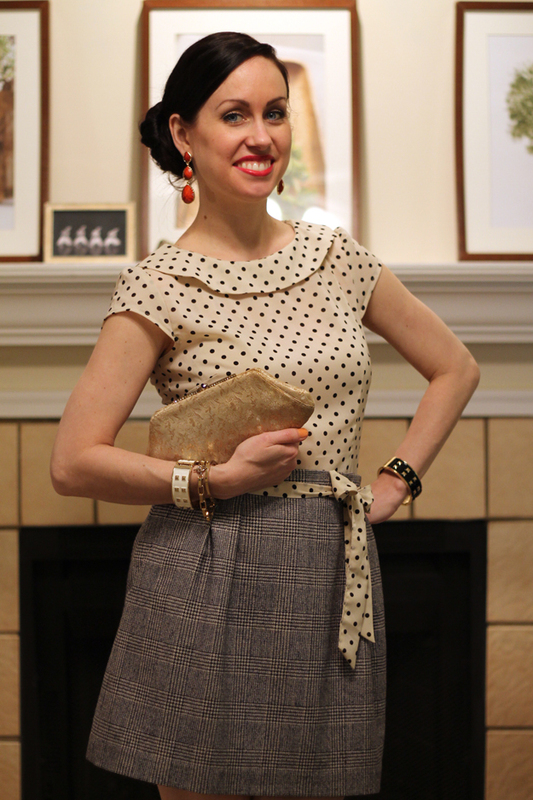 I also love the polka dot top. I'm so into cap toed shoes right now! LOVE these! Love your make up! The red lipstick is definitely a knock out. What a great outfit. Great outfit and exquisite clutch!!! Mary Ann! What a gorgeous outfit! And that clutch is perfect with the shoes! I have a lot of thrifted things that I LOVE but probably look a little shabby in other people's eyes. But I think that's what makes an item so special - all the flaws give it character!